You may cover shifts for people and come in outside of your regular work hours, but you cannot always say yes. This can potentially conflict with your own personal agenda or even your health. You need your time off, so do not be afraid to take it. If you want to say no to working, you will probably feel as though you need to give a reason. Simply saying ’no,’ may not seem like the best answer. Provide a little context, without going into too much detail. When you start filling in small, insignificant details, it can seem more like an excuse than a real reason. If you say, I can’t come into work because I have to clean my kitchen, give my dog a bath, and go look for new curtains, this turns into an excuse-like answer. At the end of the day, you’re not doing anything wrong. You were not scheduled, so you do not need to go in. If you’re available next time, then happily say yes. However, if you do not want to go or you can’t, you should not be afraid to say no. Although inappropriate, some bosses may continue to ask after you have already said no. In doing so, they are either desperate, or they believe that they can change your mind. If this is the case, do not continually change your answer. This will only further their behaviour and make your decision harder. You need to stick to your original answer, making it clear. If they continue to ask, you can say, I understand what you want, but I cannot come into work. That will not change, I’m sorry. This is a polite, but direct approach. If they continue to ask, then you may need to reassess your current situation. This would be not only inappropriate, but unreasonable. When you communicate, it’s important to be confident. If your decision is no, then stick to it. If you waver, you may give the impression that you could potentially come into work. There is no point in creating stress for yourself. Be assertive in your answer. When you’re confident, people are more likely to accept your answer. Perhaps you are busy or have a family function, whatever the reason, you said no. Although you cannot fulfill this request, let your boss or manager know that you are open to them asking next time. Yes, you are saying no to the present request, but you’re following with a positive offer. Just because you say no, doesn’t mean that you can’t offer suggestions. If you’d like, offer some alternative options. Perhaps a task can be delegated to someone else? This shows that you do care about the task being accomplished. See how urgent the task is. You may even offer to come in early for your next shift and do some work. 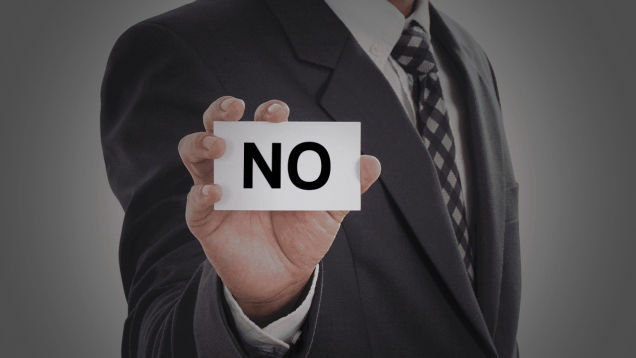 Stay firm regarding your ’no,’ but offer any options you can think of. Your time off is important. It allows you to re-charge your batteries, tend to your personal life, and take a step back from the workplace. You need that, so do not feel pressured to go into work when you can’t. More often than not, a firm no, I cannot will do the trick. You can avoid saying ’yes,’ without feeling bad. Be confident in your answer, while providing potential solutions.